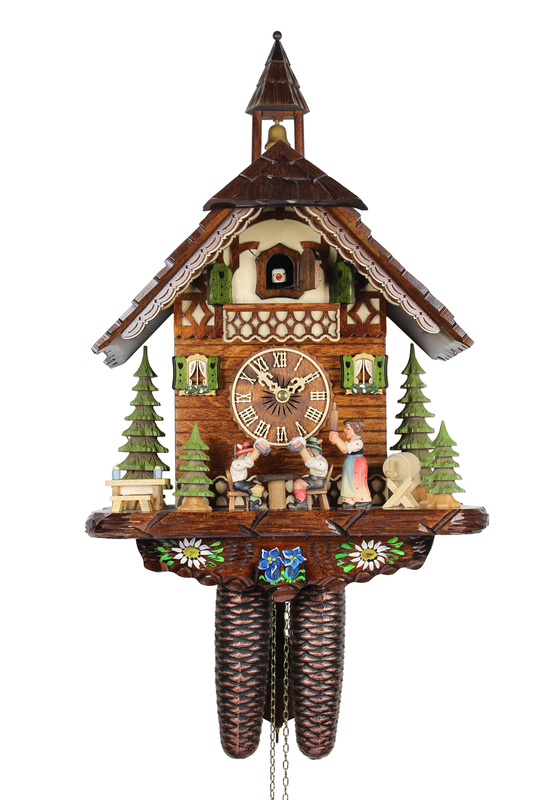 A cuckoo clock with a typical Black Forest house with a hand-carved roof and a bell tower. The beer drinkers raise their mugs to each other, while one of them is being told off by his wife and her rolling pin. The movements take place in time to the cuckoo call which is once on the half hour and on the full hour according to the time. The clock is personally signed at the back by the manufacturer Adolf Herr. His signature guarantees the experience of 6 generations of clock-workmanship. This clock comes with a certificate of authenticity (AHC). Height: 17 Inches (43 cm), only clock case with bell-tower, without weights and pendulum.